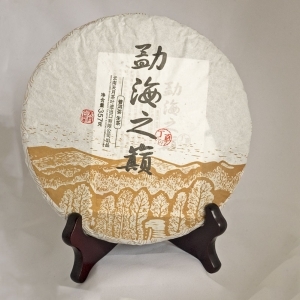 The location of 滑竹梁子山 “slippery bamboo beam” pu’er tea originates in the mountains of Xishuangbanna, Yunnan. There are many wild bamboo trees the locals call “slippery bamboo.” This sweet bamboo is fine and tall, long and slippery. The morning mist floats through the bamboo and tea trees like a soft smoke. The tea is named “Menghai Family“（勐海之家）is grown in the original forest at the top of Xishuangbanna mountain at nearly 8,000 feet, providing a clean environment. The tea leaves shape is tight and even, grayish brown in color. The liquid is a bright yellow with a full, fresh, sweet aroma and flavor. 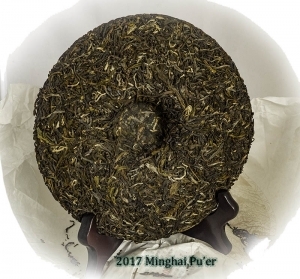 This Pu’er tea is a low-priced, medium strength option that is perfect for the beginning Pu’er drinker. Infuse the leaves for about 10 seconds with water slightly cooled off from a boil. Any longer and it can become bitter. Each tea cake contains 357-grams. 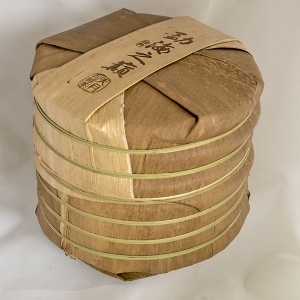 You can also order a package of 7 cakes beautifully wrapped in local area bamboo. As a member of our Tea Club, you’ll also receive up to a 25% discount on re-orders of the tea you like the most. If you have a coupon code, enter it after adding items to cart. Then click the “checkout” button to purchase. Save money by purchasing more. FREE SHIPPING on orders over $100!